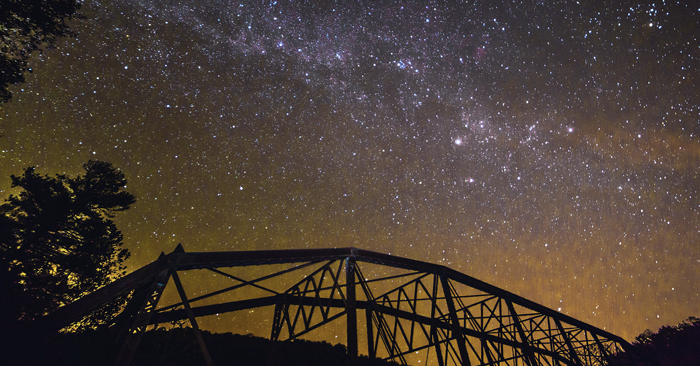 The Winter Milky Way arches high over Nemo Bridge at Obed Wild and Scenic River. Photo by Brandon Jett. The National Park Service and IDA are pleased to announce that Obed Wild & Scenic River (WSR) in Tennessee, U.S., has been designated an International Dark Sky Park. With this designation, Obed WSR is now the second National Park Service unit east of Mississippi River to earn this designation and the 20th U.S. National Park Service unit to do so. The park preserves natural nighttime darkness over one of the last free-flowing wild river systems in the eastern United States. Starry night skies are an important part of the special places the National Park Service protects. Our national parks hold some of the last remaining harbors of darkness and provide amazing opportunities to experience this critical resource. Obed Wild & Scenic River is one of these special places with a truly dark night sky. Among Obed’s interpretive themes is a primary goal to reconnect life and nature by discussing the value of quiet, solitude, and even darkness in the noisy, frenetic, and developed world of the 21st century. To qualify as an International Dark Sky Park, Obed demonstrated exceptional dark-sky conditions, and a strong commitment to preserving the park’s night sky resource for the enjoyment, education, and inspiration of present and future generations. Since 2013, the park has offered year-round astronomy and dark sky interpretive programs, supported by a strong collaboration with local amateur astronomers from the ORION Astronomy Club in Oak Ridge, Tennessee and the Knoxville Observers in Knoxville, Tennessee. The Obed park staff started working with the International Dark Sky Program on certification efforts several years ago, including collecting data, offering Night Sky Junior Ranger programming, and making sure that all park activities considered night sky as a valuable natural resource. “Just as it is important for people to be able to hike, rock climb, fish, paddle and so many other activities in this beautiful place, it is essential that the wonders of the night sky be available for all to experience,” said Superintendent Niki Stephanie Nicholas.